Caley Hirsch’s science class began a new restoration project in a corner of Lefty Gomez Field in 2014. 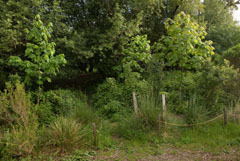 At White Hill Middle School in Fairfax, Friends initiated a habitat restoration project in fall 2004, in cooperation with several science classes, to replace broom and non-native blackberry with native plants along Fairfax Creek and in adjacent upland areas. Upper Fairfax Creek is inaccessible to salmonids owing to a long culvert in downtown Fairfax and a dam adjacent to Olema Road, but wildlife seen on campus by students includes a Pacific giant salamander and tree frogs. 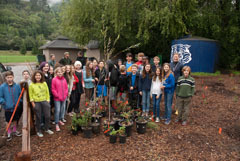 Funding has been provided by the LEF Foundation and the California Alpine Club Foundation, and water for initial irrigation by the Ross Valley School District. Friends together with earlier classes planted a variety of trees and understory plants at the edge of a play yard at White Hill School. This project consists of two parts. The plan was to first replace a seriously undersized box culvert at 300 Olema Road and then to widen and replant a section reaching approximately 300 feet downstream of the culvert, to the top of a concrete dam. However, for reasons beyond Friends’ control, the order of these projects was reversed. In 2007, a Marin Conservation Corps (now Conservation Corps North Bay) crew planted 700 container plants in the lower section, drove over a hundred willow stakes, and built a living willow wall and a willow mattress. Very heavy rainfall in January 2008 caused flooding at 300 Olema Road, where water overflowed Fairfax Creek upstream of the box culvert. Much of the restoration work was destroyed, and the left bank was seriously eroded by water shooting from the culvert. In summer 2008, the undersized culvert was replaced with a larger culvert, reducing the threat of further damage to the project area. Project funding was provided by MCSTOPPP, Department of Water Resources Urban Streams Restoration Program, and Ross Valley Sanitary District. The property owner provided irrigation for the first three years. 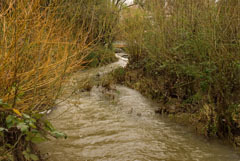 Fairfax Creek, downstream of 300 Olema Road, with four species of willow planted by Friends.